Everyone seems to be talking about CBD these days. 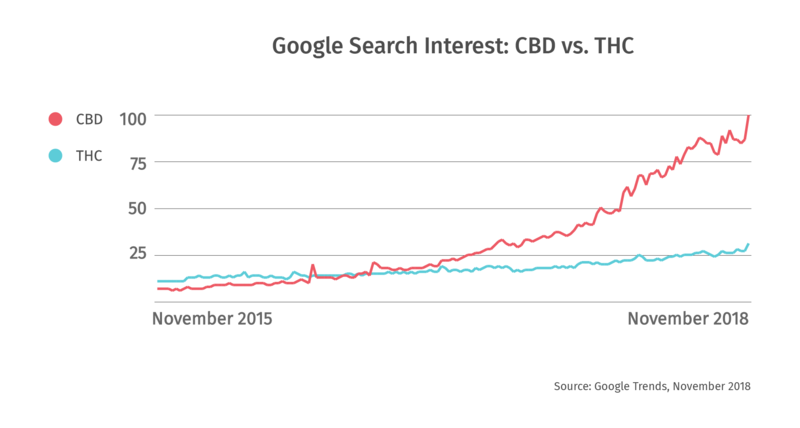 Both on Google and Leafly, search interest for CBD has been skyrocketing. According to Google Trends, interest in CBD as a search term is now four times higher than it is for THC. 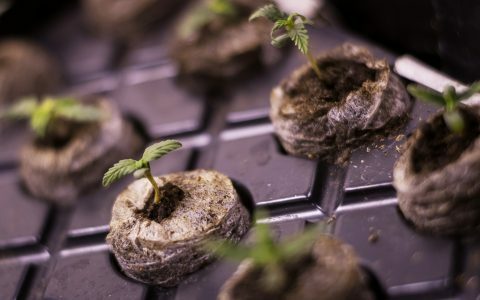 Much of this is probably driven by all the buzz around CBD’s potential health benefits, including recent news of the FDA’s approval of Epidiolex, the CBD-based pharmaceutical drug for treating childhood epilepsy. Whether or not you should believe the CBD hype is another story that’s been covered elsewhere. 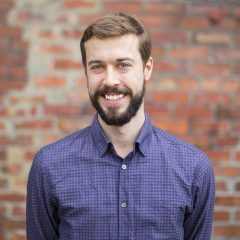 In this article, we will dive into data from Google Trends, cannabis testing labs, and Leafly data from consumers and cannabis stores. What kind of CBD products are common in the marketplace and what kinds of CBD products and strains are consumers looking for? How Common Are Cannabis Products Containing CBD? CBD-dominant products are the opposite. They contain mostly CBD and are most suitable to consumers looking to avoid getting high altogether. Balanced THC/CBD products fall somewhere in a middle, with intermediate levels of both THC and CBD. They are most suitable to less experienced consumers or those highly sensitive to THC. Despite the explosive growth in consumer search interest in CBD, the charts below show that THC-dominant products still make up the bulk of the legal cannabis marketplace. How Common Are CBD Products in Testing Labs & Cannabis Stores? First, let’s look at how well-represented CBD-dominant and balanced products (referred to together as “CBD-containing products”) are in cannabis testing labs. Testing labs are one of the earliest links in the supply chain, and all legal cannabis products have to undergo compliance testing before going on sale. This includes having total THC and CBD levels measured. 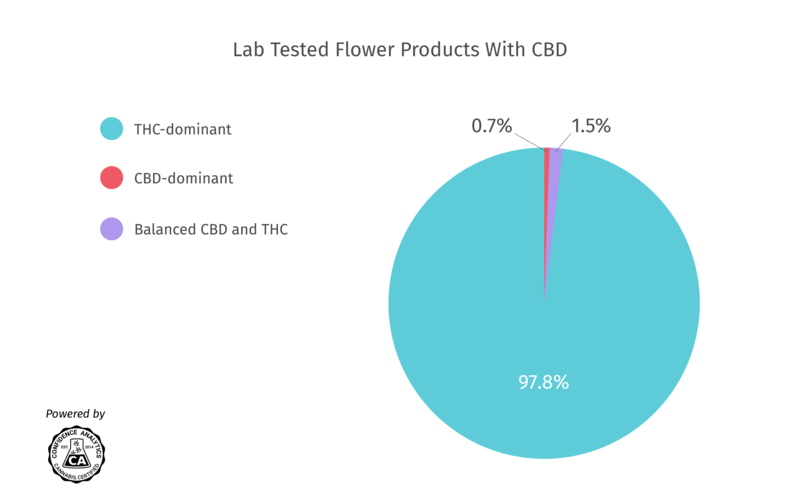 We looked at data from Confidence Analytics, a state-certified testing lab in Washington, to see the breakdown of THC-dominant, CBD-dominant, and balanced THC/CBD flower products being tested in that state. CBD-dominant and balanced products are slightly better represented for concentrates compared to flower, but THC-dominant concentrates still represent over 92% of test results. What about edibles? Although THC-dominant products still represent the vast majority of edibles tested in Washington, the pattern is somewhat different compared to flower and concentrates. CBD-containing products represent over 20% of edibles tested. THC-containing edibles can be risky as their onset, intensity, and duration of their effects are often unpredictable. 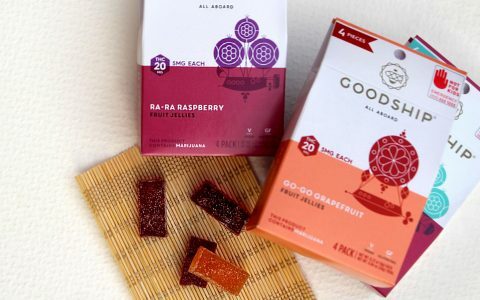 Some consumers may prefer edibles that contain some CBD in order to mitigate those risks, and perhaps this drives a higher prevalence of CBD products in the edibles category. The prevalence of CBD-containing products across all cannabis store menus on Leafly is marginally higher than what we see from a Washington testing lab, but the marketplace is still mostly composed of THC-dominant products. 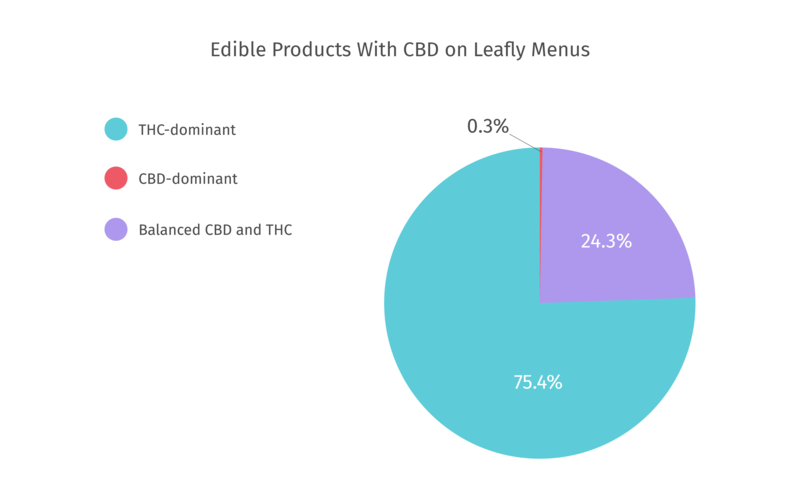 Again, CBD-containing products are more common for edibles than for flower or concentrates, representing nearly 25% of edibles on Leafly menus as of this writing. Is the higher incidence of CBD-containing products for edibles driven directly by consumer demand? Perhaps people are looking for CBD in edibles more than other product categories, and supply is chasing this demand. To investigate this, we can look at Leafly search data related to CBD to see where consumers’ attention is turning to the most. What CBD Terms Are Cannabis Consumers Searching for on Leafly? Millions of people visit Leafly every month, which gives us robust data around what consumers are searching for and viewing. 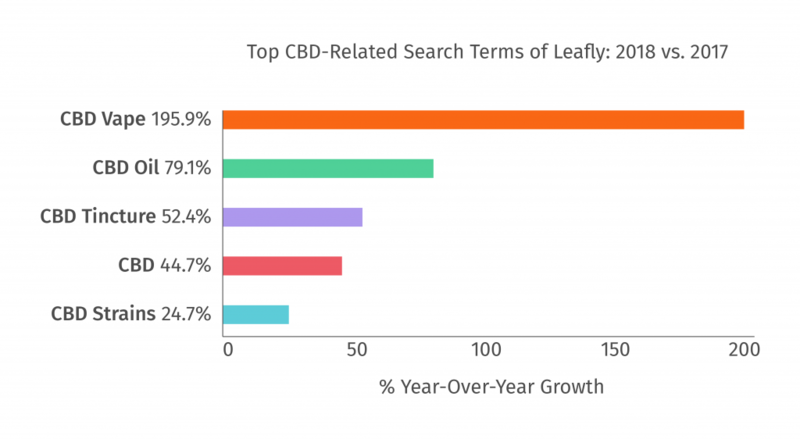 Similar to what we see on Google Trends, there has been large growth in recent years in CBD search terms on Leafly. To see what specific CBD terms are capturing the most attention, we looked at five of the largest CBD-related search terms on Leafly in 2018 by volume, and sorted them but their overall growth rate compared to last year. Interestingly, search terms like “CBD edible” or “CBD pills” don’t show up on the list. The fastest growing search term among Leafly users is “CBD vape,” which may reflect not only growing consumer interest in CBD itself, but vaping as a method of consumption. 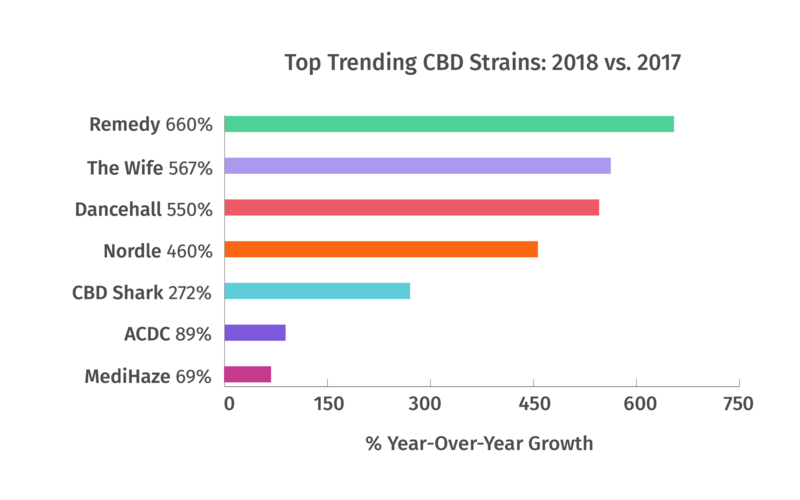 We also see strong growth in search interest for terms like “CBD oil,” “CBD tincture,” and “CBD strains,” reflecting interest in specific form factors and strains with CBD (see below for the top trending CBD strains of 2018). It’s worth noting that some of these terms, like “CBD oil,” are ambiguous in that they likely represent a mix of people looking for CBD oil in pill form, concentrates, etc. 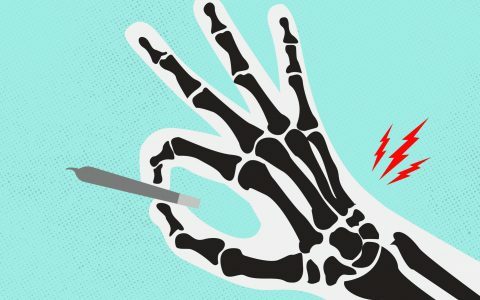 Given the exploding consumer interest in CBD generally, and the growth we see in search terms like “CBD vape” and “CBD strains” specifically, it’s somewhat surprising that THC-dominant strains are still so heavily represented in the Leafly strain database and the product landscape for flower and concentrates. This may simply reflect the legacy of the industry’s past, reaching back to the illicit market and its more or less exclusive focus on THC. 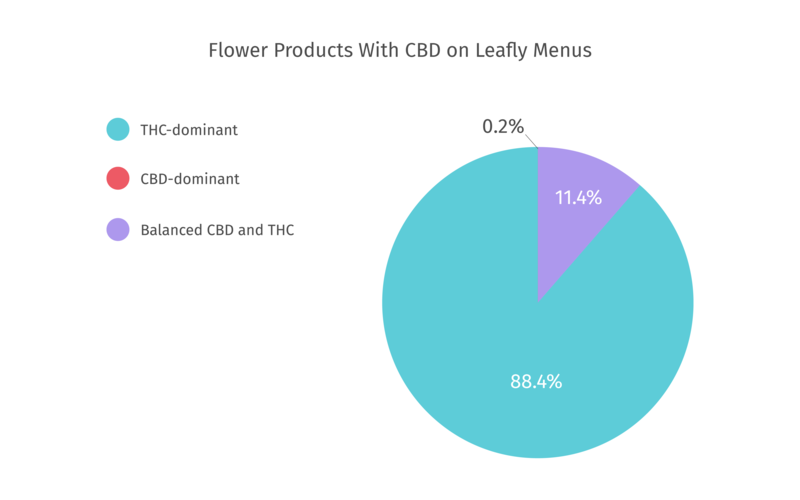 The high consumer interest in CBD we see reflected in Leafly search data may be signaling that the composition of the product landscape is primed to shift in order to meet changes in demand. If it’s true that there’s a mismatch between trends in consumer demand and the products being offered, this may indicate supply-side opportunities to meet emerging consumer trends. For example, given that the fastest growing CBD-related search terms on Leafly include “CBD vape,” “CBD oil,” and “CBD strains,” an interesting hypothesis is that vaporizable cannabis oils made from CBD strains will be increasingly sought after by consumers. An interesting case study suggests that this may be true. Heylo Cannabis Extracts is a Washington-based company that specializes in producing vaporizable whole-plant cannabis extracts. Their product offering emphasizes cannabis oil formulations with rich cannabinoid and terpene content rather than a narrow focus on THC. Many of their best-selling oils are extracted from CBD-dominant or balanced THC/CBD strains. 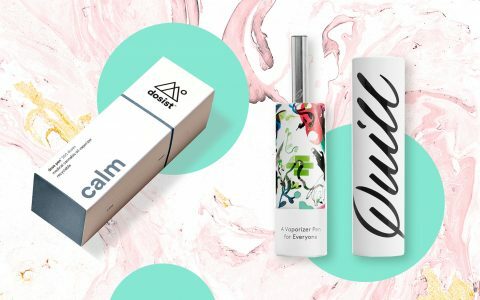 What CBD Strains Are Trending With Consumers in 2018? At the top of the list is Remedy, a relatively well-known CBD-dominant strain often used for relaxation and pain management. With 660% traffic growth compared to last year, Remedy is the top trending CBD strain of 2018 so far. Remedy, The Wife, Nordle, and Dancehall represent the four fastest growing CBD strains, each with well over 400% year-over-year growth. Find 2018’s top trending CBD strains near you. 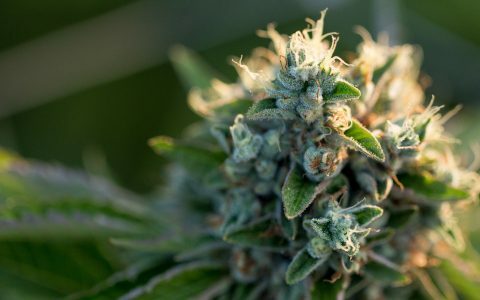 The historical emphasis on THC levels means that there are a lot more strains with very high levels of THC compared to those with very high levels of CBD. Any growers able to create high-yield, high-CBD strains may be in a good position to help supply meet demand. 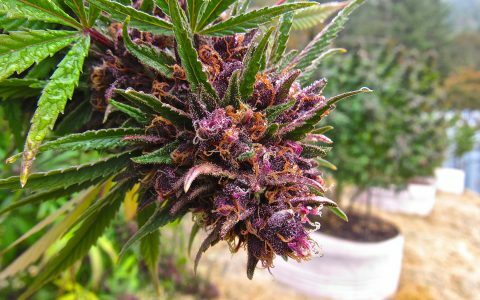 There may be good reasons to expect the product landscape to shift emphasis away from products with the highest possible THC levels. With countries like Canada leading by example and more and more US states implementing adult-use laws, we are in the midst of a global paradigm shift in legal cannabis consumption. The influx of large numbers of new cannabis consumers, many of whom will want to specifically avoid highly potent products, could accelerate this shift. Because many new consumers will be inexperienced with cannabis, balanced THC/CBD products that produce a “light” high seem like a natural place to start their cannabis journey. I’ve personally witnessed first-time consumers in cannabis stores being recommended potent THC-dominant strains like GSC and Original Glue simply because they’re well-known strains. 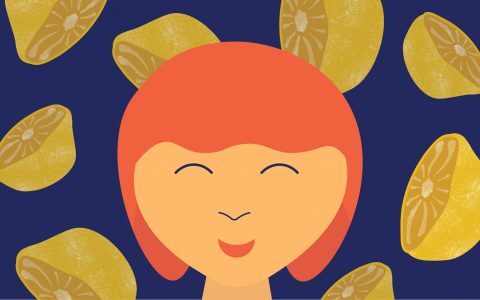 If responsible consumption is going to be a priority for the industry, we need to be able to direct consumers to products best-suited to their experience level. It’s also common to see new consumers get directed to edibles, including pure THC products with individual doses of 10-20 mg or higher. 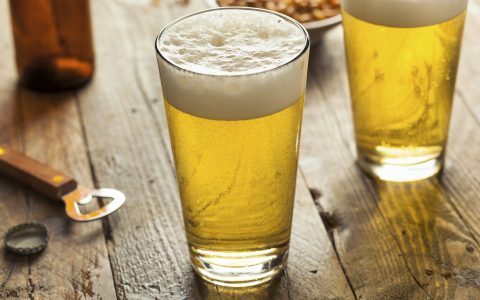 (A friend once told me a story of their grandma being sold a cannabis beverage infused with 100 mg THC, and given no instructions on proper dosing). Unlike edibles, vaporizable cannabis oils are fast-acting and allow consumers to titrate their dose with more precision. I expect vaporizable cannabis oils, especially those containing CBD and other non-THC cannabis compounds, to continue rising in popularity. Exciting to see interest in cannabis-derived CBD flourish. Now on to the full-spectrum of rare cannabinoids! It is true that CBD has been the main topic for quite some time now. Everywhere online, people are talking about the potential health benefits of cannabis. And many people now are looking for ways to have access on it especially people with illness. Stats here can prove this! What strain do you think the big one will be for 2019?